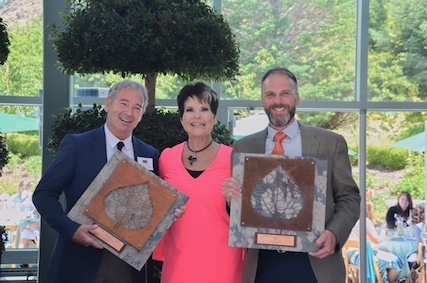 Visit Salt Lake (VSL) presented its annual “Tourism Achievement Award” to SMG and Utah Food Services. SMG is a worldwide facility management company contracted by Salt Lake County to manage the Salt Palace Convention Center, South Towne Exposition Center and the Salt Lake County Equestrian Park and Event Center, while Utah Food Services is the exclusive convention caterer at the Salt Palace Convention Center and South Towne Expo Center. Both SMG and Utah Food Services are two very deserving members and partners in the catering for conventions business, making good on the promises made to professional meeting planners as well as convention clients. Though they are uniquely different in who they are and what they do, SMG and Utah Food Services often work hand-in-hand to ensure incoming conventions and the hundreds of thousands of attendees VSL hosts each year have not only a memorable time during their convention, but a remarkable one as well. Compact; Bishop H. David Burton of the LDS Church; Randy Horiuchi last year; and many other business and community leaders. Visit Salt Lake is a private, non-profit corporation responsible for the promotion of Salt Lake as a vibrant, modern destination brimming with unexpected dining, lodging, nightlife and entertainment options, a destination well suited for convention and leisure travel alike. In partnership with Salt Lake County, Visit Salt Lake’s mission is to improve the area economy by attracting and providing support to conventions, leisure travelers and visitors while being a leader in environmental responsibility. For more information on all that Salt Lake has to offer, go to www.VisitSaltLake.com. For more information about our catering and community outreach, please sure to visit our Utah Food Services Catering Blog every week.